Today’s weekly Forsa survey for Stern and RTL shows Chancellor Angela Merkel’s CDU/CSU adding national momentum to its big weekend regional victory in Nordrhein-Westfalen. 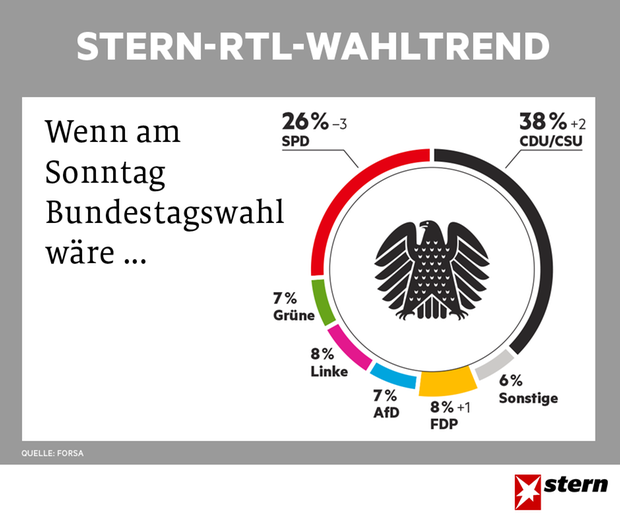 At 38 per cent, the CDU achieves its best voting intention score with Forsa since 18 January. Moreover this is the best poll for the Christian Democrats with any of Germany’s eight polling firms since that month: only two other scores of a similar level have been recorded this year, 38 per cent with Emnid on 7 January, and 39 per cent with GMS on 4 January. Just as significant is the stretching of the CDU’s lead over its national coalition partner the SPD to 12 points, again the best since January with Forsa. It is necessary to look back to that month to find similarly low Social Democrat scores with other pollsters too – in other words, before current Chancellor-candidate Martin Schulz took over the party leadership. The Forsa poll is another boost for the liberal Free Democrats (FDP) following their excellent double-figure tallies in the Schleswig-Holstein and Nordrhein-Westfalen state elections. The FDP last hit 8 per cent with Forsa in May 2016. However that was only a brief blip interrupting a long run of mediocre scores, and the question is now whether the FDP can sustain its polling gains through to the September Federal elections and re-establish a presence in the Bundestag. All other parties are unchanged in this week’s survey. Fieldwork: 08.05-12.05.2017. Released: 17.05.2017. Participants: 2506. Method: Telephone poll. 24% of respondents undecided or won’t vote. Full report on the Stern website here.